Hampton, VA Here we come - and we're bringing a new panel! We hope you had a wonderful Valentine's day! Spring is just around the corner and we can almost feel it! It's going to be in the 50's this week here in central Iowa, and we are so excited! We first want to introduce you to a panel we were able to order more of. Many of you know the story of the hymns "Amazing Grace". The writer lost his family at sea, and wrote this hymn afterward. It shares his pure joy and love of God. 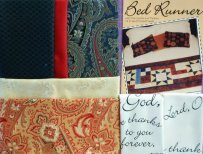 Each panel is 24" wide 42" long and sells for $10.00. 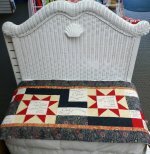 We'll have them at the Quilt Expo in Hampton, Virgina! 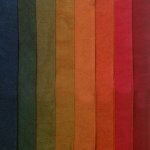 Colors include beige, teal, turquoise and brown. the Mid-Atlantic Quilt Festival. February 25th-28th. 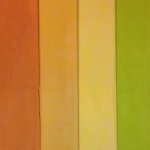 Hand dyed 100% Cotton from Cherrywood Fabrics. Their suede-like look is beautiful and one-of-a-kind. Sold in Fat Quarter Bundles of 4 and 8. And last, but not least... our popular Bed Runner Kit has a new look! 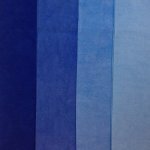 It now features reds, blue-grays and paisley! Have a good rest of your week and happy quilting!